Processing. Processing. This week the TrekRanks podcast is most certainly functioning within normal parameters as we dissect one of the most popular characters in Star Trek history. It&apos;s time for the Top 5 Data Episodes with hosts Jim Moorhouse and Jeff Hulit, who are joined by Andi from Women at Warp and long-time Trek podcaster Matt Hansen. All four hosts endeavor to function adequately in a deep-dive conversation on the key elements of Brent Spiner&apos;s iconic character, breaking down their favorite Data moments and episodes. After a brief introduction of Andi and Matt, our TrekRanks crew jumps straight into a discussion on everyone&apos;s Prime Directive guiding their ranking criteria. Jim, Jeff, Andi and Matt then break down their selections in The Order of Things by revealing their "Five Word Summary and Hashtag" for each of their Top 5 Data Episodes (or more accurately, their favorite Data moments). The selections run the gamut from emotional to comedy to surreal, as many Data episodes do, and the result of their discussion reveals a cross-section of moments that help define the popular character. The Secondary Systems section of the show goes even more in depth on some of the moments that just missed out making their lists. More than a half a dozen soundbites from select episodes are also featured in the episode to help highlight many of Data&apos;s defining moments. After a quick recap of all the picks in the Regeneration Cycle, the episode concludes with a visit into a Temporal Causality Loop as we flashback to Episode 7 for listener feedback regarding our Top 5 One-Off Villains. 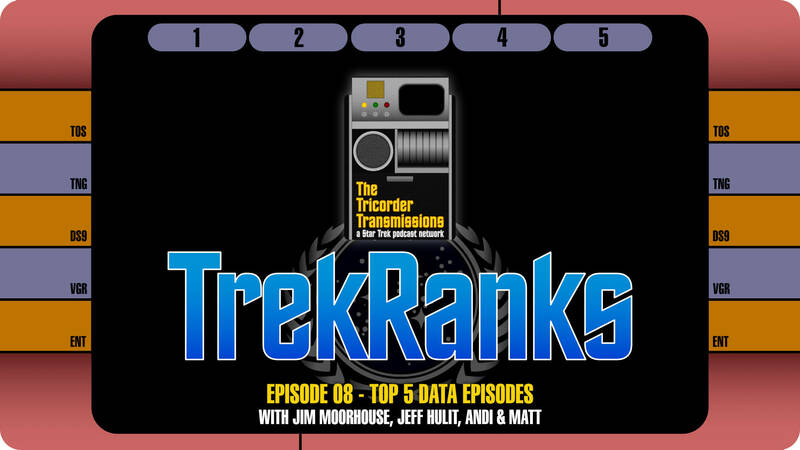 As always, make sure to hail us here on our website by leaving a voicemail and record your own personal TrekRanks log to let us know your Top 5 Data Episodes in Star Trek history. Your comments might be used via a Temporal Causality Loop in an upcoming episode.